Granites make up the main family of deep igneous rocks, at least by the frequency of their occurrence. They only appear at the surface after the erosion of everything that was covering them. Apart from quartz, feldspar and the micas, pyroxene, often with sodium, amphibole and many others are found in granites. Microgranites have very small crystals whereas those of pegmatites are very large; obsidian is a silica glass, and the rhyolites, lavas made of granite rock, are very rare. Composition: quartz, potassium feldspars, sodium plagioclases and micas. Granite can occur in a range of colours. Mean chemical composition : SiO2: 73 %, Al2O3: 14 %, (Na2O, K2O) : 9 %, oxides (Fe, Mn, Mg, Ca): 2 %. Category: Acidic igneous rock, containing more than 66% of silica. Natural colours: Grey, beige, pink. Deposits: frequent but not necessarily exploitable. Associated minerals and rocks: quartz, micas, amethyst, and others. 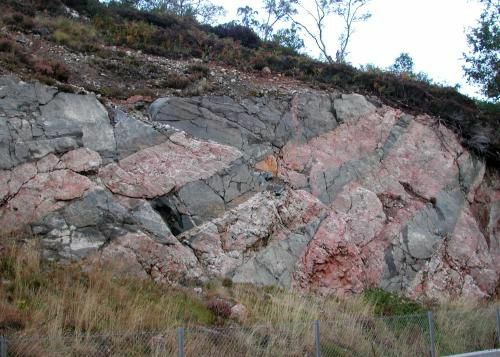 Granitic batholiths can be relatively small and well delimited, but they have often risen as enormous, quite heterogeneous masses within ancient Precambrian shields. It is interesting to note in this connection that nearly all the granitic formations of the secondary era are concentrated around the Pacific. The development of ideas on granites has been the subject of sharp controversy. Today, the variations in geometric data of granites require various different origins and creation mechanisms to be considered. When not weathered, granite is an excellent building material and can even be decorative after polishing. Nearly all Brittany's religious monuments were built of granite. The naturally abundant granite in Brittany is also used to build Calvary crosses, parish enclosures, funeral chambers and some lighthouses. The use of granite is far from recent. Indeed 5000 years BC man was using granite for menhirs and dolmens! A granite formation is always split into parallelipipedal blocks by cracks called diaclases. These form a more or less dense network extending in three perpendicular directions. These diaclases generally only exist at the surface of the formation. However, they play a substantial part in deterioration: they allow water to infiltrate and are " weak spots" from which the deterioration spreads. Rain water infiltrates the diaclases weathering the granite. This weathering, which results in the disintegration of the rock, is actually a chemical transformation of certain granite minerals. Thus it loses its natural cohesion and is transformed into coarse granitic sand composed of grains of quartz (inalterable), weathered crystals of feldspars, flakes of clay (hydrated aluminium silicate) and soluble components. The products of weathering are carried away in the solid state or dissolved by trickling water. A chaotic assemblage of granite blocks is left.